The HydraFacial™ resurfacing procedure thoroughly cares for your skin, providing: cleansing, exfoliation, extraction, and hydration all while infusing antioxidants, peptides, and hyaluronic acid. The HydraFacial™ is a non-invasive, non-surgical procedure that delivers instant results with no discomfort or downtime. The procedure is soothing, moisturizing, non-irritating and immediately effective! 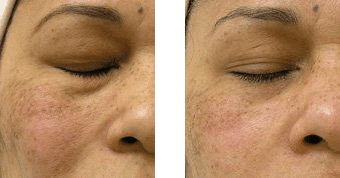 The HydraFacial™ serums specifically target your skin issues including sun damage, blackheads and whiteheads, enlarged pores, provides an aggressive acne treatment, brown spots, uneven skin tone, and early aging fine lines and wrinkles. Watch a HydraFacial Treatment at Advanced Skincare and Laser.